Regarded as one of the biggest games of the UEFA Champions League Round of 16, the tie between Chelsea and Barcelona ended in a fascinating 1-1 draw at the Stamford Bridge. Willian gave Chelsea the lead in the 62nd minute of the game, but Lionel Messi equaliser in the 75th minute has livened up next month’s return leg tie. Although a lot of pre-match talk was focused on Lionel Messi and Eden Hazard, both the teams’ most influential central midfielders cannot be ignored in a battle of such prominence and intensity. 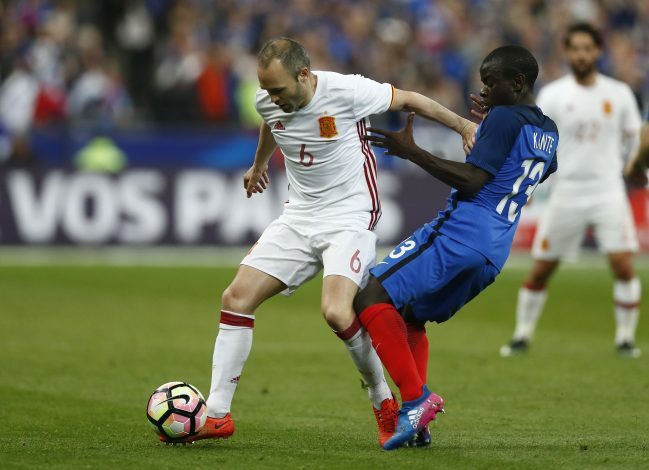 N’Golo Kante and Andres Iniesta both performed very well, and it was the latter that enjoyed a more satisfying return after providing the assist for Lionel Messi. Barcelona, as expected, dominated possession and had more midfielders (4) on the pitch, as compared to Chelsea’s (2). But credit to Kante for growing into the game and making vital interceptions. Iniesta, on the other hand, wasn’t allowed much space either, but when it mattered, he was there to spot the killer pass for Messi. Both had different roles and positions to cater to, and both sets of fans thoroughly enjoyed the duo’s performance. Chelsea boss Antonio Conte got his tactics spot on over the course of 90 minutes, preventing Barcelona’s star players – Lionel Messi, in particular – to inflict a lot of damage. His counterpart Ernesto Valverde did not get his tactical shape right this time, but will come out as the happier manager in the end, despite knowing his team was the second best. The Frenchman initially struggled to get going, and only had two touches until the 25th-minute mark. He had completed a pass, and his next was a free-kick given from a handball. With Barca keeping most of the possession, Chelsea were made to do a lot of defensive work, and they did it right. Meanwhile, Iniesta looked dangerous on the ball and made some promising runs down the left of midfield. But the player was kept out of meandering into dangerous positions. The Spaniard was scuffed out, as Chelsea’s defensive line maintained the understanding. But as far as the start in the match goes, Iniesta drew the betterment for his sense and his team’s possession. He also spun Kante numerous times. The biggest trademark of Kante is his ability to press and make successful tackles. Despite the struggles early on, he hit back by dominating the midfield. The former Leicester player did all the handwork and kept Lionel Messi quiet throughout. He handled his job well against the likes of Ivan Rakitic and Iniesta too, and did not give them the space to surge vital passes. Energy played a role here, with Iniesta not as quick as he used to be during his golden years. But although the Barca legend kept showing his guile at times, Kante relentlessly worked hard in helping his team maintain shape defensively. He ran everywhere, and his man marking of Messi and the interceptions were a stellar act. Both players had different roles and did their job well. Therefore, the Frenchman did not have as much passes as his counterpart. He completed just 25 out of the attempted 30 to Iniesta’s 88 of 97. Kante may have been the best midfielder on the pitch for an hour, but Iniesta’s craft lies in finding that stellar pass, and he did just that at the right time. His understanding with Messi helped in this process. A poor mistake from Andreas Christensen saw the ball land to Iniesta, who presented Messi with an opportunity to end that 73-minute drought against Chelsea. Many would have though Iniesta was likely going to take a shot, but his judgement and vision paid dividends for Barca. His creation on the left edge of the area was crucial after making a decisive run to win the ball from minimum spaces and create magic from there on. On the other hand, Kante had a promising situation early on, with Barca defenders clearing the lines from an attempted Eden Hazard pass inside the box, with the ball landing straight to Kante. But unfortunately, it hit his hand, and on another day, he could have presented his team with a chance. Barcelona go into the return leg at the Camp Not as favourites, but Chelsea know they can repeat the 2012 heroics and come away with a result. The tie is certainly far from being over.